Water utilities globally are facing challenges associated with climate change and aging water infrastructure. In addition, there’s pressure to limit leakage and non-revenue water (NRW) loss, which includes leakage of treated water from assets within drinking water systems. These leaks lead to increased operating expenses, an increased number of major pipeline bursts and the entry of foreign matter into pipelines, impacting water quality and public health. Ongoing leakage in pipelines further undermine the condition of aging assets and make a difficult situation worse. 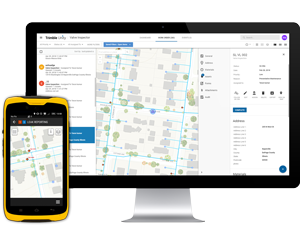 Trimble’s NRW solution introduces innovative technology for enabling utilities to address these challenges. Combining advanced 4G LTE wireless IoT sensors and innovative cloud and mobile software, the comprehensive smart water solution helps reduce water loss and improve network visibility and operations through real-time leak detection and monitoring of water pressure, level and flow. The Trimble NRW solution includes the Trimble® Unity NRW software application, the new Telog® 32 Advanced Series of 4G LTE Wireless Water Monitoring Devices and Trimble Wireless Leak Detection. By identifying leaks proactively, utilities can prevent water loss occurring from small underground leaks that may not yet be visible. Pinpointing and fixing high risk leaks early, utilities can reduce large pipeline bursts that result in large water losses and service interruptions. Reduced numbers of bursts and leaks minimzing collateral damage to the wider infrastructure (roads, homes, buildings), property and environment. Lower the cost of leak repairs and increase effeciency through targeted dispatch and tracking of work and repair activities.